Tix on sale now! They make a great stocking stuffer!! We have a new banquet hall location its the Gibbs Hall (Fort Monmouth Golf Course) 200 Lowther Dr, Eatontown, N.J. 07724 Suneagles Golf Club - Now open to Public! This new venue and room holds up to 500 people. 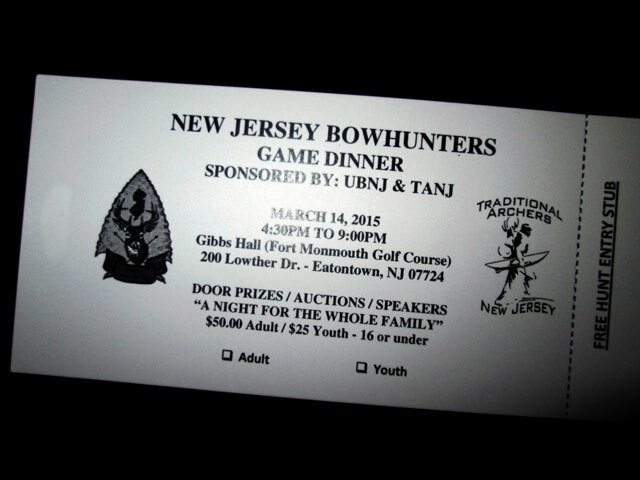 The funds that are raised help us in our fight for all that we do for N.J. Bowhunters and the sport of Archery for members or non-members alike. Our yearly donations to various events to support Bowhunting, 3D ,Target & Educational Seminars on the sport that we all love. Remind your friends who are not members that “thanks to our help” they now enjoy Sunday Bowhunting – and the 150' Bowhunting Rule. Hopefully in the near future with your continued support we can have a N.J. Bear Bowhunting Season. Most of all we need your support now to help fight the growing numbers of anti-hunters in this state.! We support many other charitable organizations with their events by either donations, purchasing archery equipment or by teaching at many of the following organizations events throughout the year - i.e. The Oxford Middle School Archery NASP Championship team for their National Archery in the School Program, North Jersey Spinal Navigators & the Lighting Wheels Handicap Archery Teams, T.A.N.J. 's Al Reader Archery in Schools Program, Boy Girl & Cub Scout Troops, 4-H clubs, Middle Schools & High Schools archery programs throughout this state, Oak Ridge Public Archery Range in Union County, Appalachian Bowmen of Sussex County, The Black Knight Bowbenders, The Garden State Archers and WaXoBe Archery Ranges and the newly formed Stevens Institute of Technology Archery & Princeton University Team. In fact only last week we donated funds to the Sussex County Charter School of Technology towards their new NASP Archery in Schools Program. 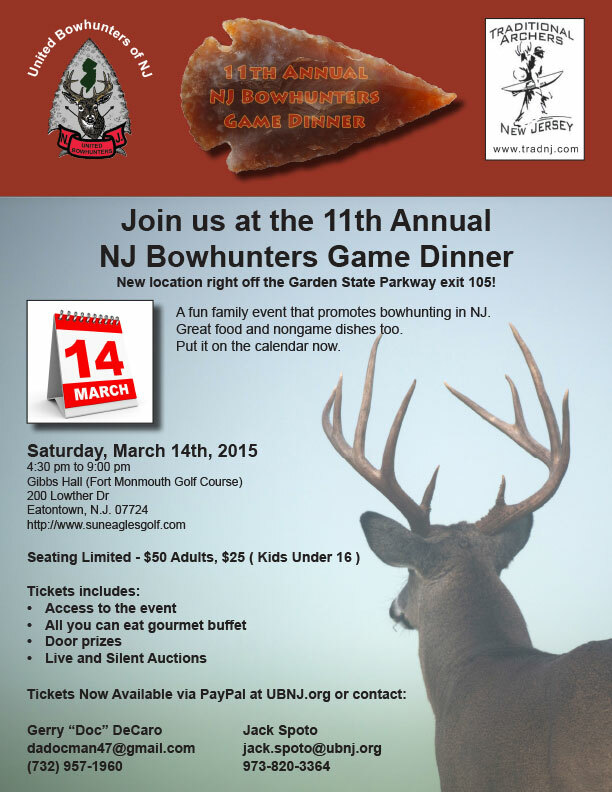 Saturday March 14th, 2015 will be another amazing night with great friends, fellow sportsman. We must be doing something right we now had to move to a bigger place to host our event at Gibbs Hall, Eatontown, N.J. and it’s our 11th year. For our menu we will have as always many venison dishes cooked so many different ways, added to the menu this year will be pheasant dishes. Besides the wild game we will also have an assortment of outstanding banquet food. Lets not forget the outstanding Stone Silo seafood cakes, carved roast turkey table with apple and cranberry stuffing with gravy with garlic mash potatoes and a green salad bar and desert coffee and much more! As always we will have hunts, art work matted and framed along with sportsman and outdoors items including outstanding baskets for the women and even archery sets for the kid’s. In addition we will have dozens of door prizes, and incredible auctions silent and live. Let’s not forget the Longbows, Recurves and Compound bows that you can win and or bid on during the night. This is night of fun for the whole family. Just tell your friends that you will be the designated driver but you get to keep all their great door prizes when they win! This year the tickets are still Adults $50 and Kids $25 (16 and under). When you purchase a ticket your name will be also entered to win a Wild Hog Hunt, Arcadia Florida. Seating will now be 10 to table. "Don't wait to purchase your tickets" please make the call now. To reserve a table for your group you must now purchase a total of 10 tickets! You can also purchase your tickets via pay pal only from the U.B.N.J. website -www.ubnj.org. When you choose to send a check or use paypal you will receive your ticket stubs in return mail within 48 hours. We are always looking for donations on Hunts and Door Prizes. Please contact us. We need your help. Instead of posting reminders threads about the upcoming dinner figured I would try to post prizes as they come in. All kinds of fun stuff in the works. Stay tuned!